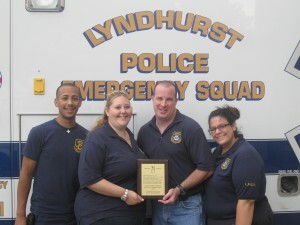 The Lyndhurst Special Angels presented the Lyndhurst Police Emergency Squad with a plaque at the July board of commissioners meeting for hosting a kickball tournament for children with special needs. LPES volunteers lead by nine-year-old honorary member AmberPaige Dolan played against two groups of Special Angels in a match that resulted in the Special Angels victory of 78 to 22. They were lead to victory with home runs by Timmy Branchick and Charles Monesterio. The Special Angels had a solid defense with pitchers Bella Banuls, Cassandra Ribustello, Danny Gongora and Sammy Spitzer shutting down the LPES team in 3 separate innings.